One of the many nice things about Mineral Point is the way the Mineral Point Care Center is woven into community events, allowing our senior citizens to take part in the festivities. The school bands gather and play there before parades and community groups frequently visit to sing, play games, give gifts or make crafts. But the biggest event from the kids’ perspective is the annual Kiwanis and Key Club Easter Egg Hunt. For weeks leading up to it, residents of the Care Center take the time to fill each egg with a goody – a sticker or a piece of candy, and occasionally they’ll slip in an old coin. This year, they received some help from the Hodan Center’s seniors. Together they filled approximately 7,000 eggs and if it’s a bad egg that just won’t close, you’ll find it carefully sealed with lots of tape. always welcomes this incursion even though the lawn mower (Mayor Bennett) and the volunteer groundskeepers probably encounter un-found plastic eggs for months afterward. In addition to the hunt, there will be face painting and a special appearance by the Easter Bunny, who we understand will be wearing a new suit. So bring your Easter basket and your camera for pictures. It’s a wonderful and free event. Everyone is welcome – this Saturday March 30, 2013 at 10:00am at the Mineral Point Care Center. 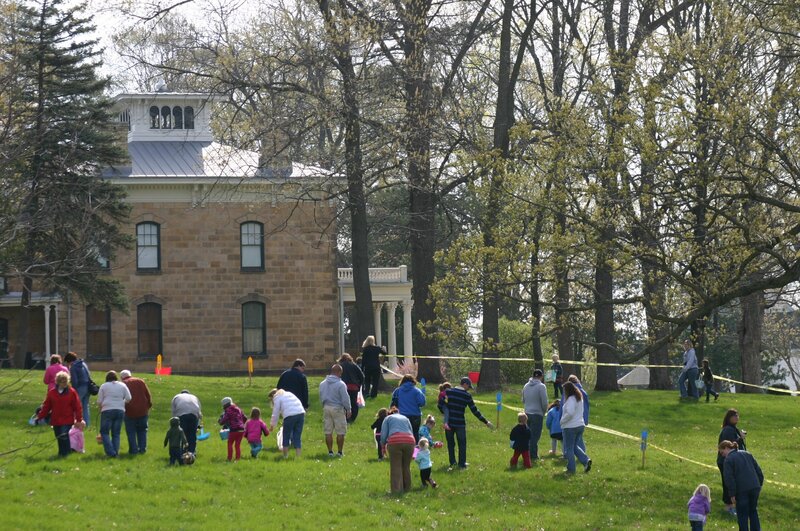 Gallery | This entry was posted in Entertainment, Family and tagged Easter Egg Hunt, Key Club, Kiwanis, Mayor Greggory Bennett, Mineral Point, Mineral Point Care Center, mineral point historical society, Wisconsin. Bookmark the permalink.